Most of you know, I used to teach Geography. I spent three years teaching 6th grade geography. I taught about Asia and Africa…most of the information I taught came from text books that I then researched to find a bit more knowledge. I taught my kids to draw maps…always freehand…and about the cultures and wonderful places of the world. 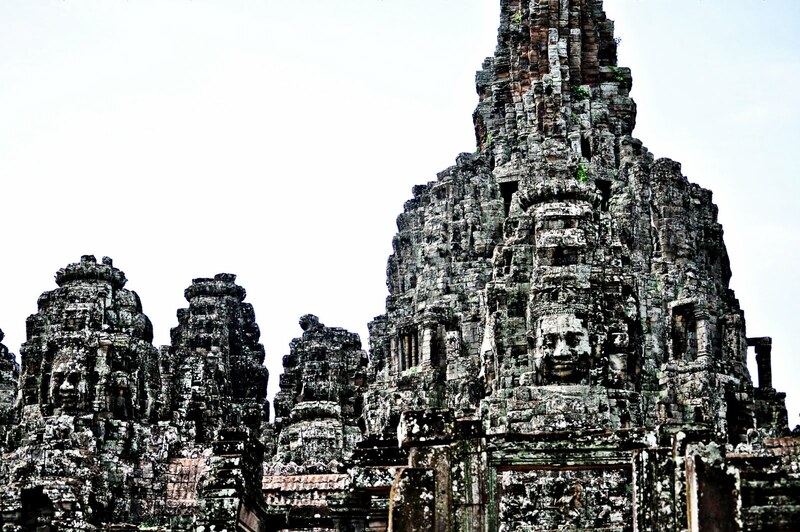 I remember teaching them about Cambodia and the huge Angkor Wat that stood. I always said it would be a dream to go and just the other day, Adam and I went, officially making one of my dreams come true. We paid an entrance fee of $20 to see all of the temples, which in turn gave us an awesome badge with our pictures on them. We had hired a tuk tuk for the day to drive us around to the different temples. 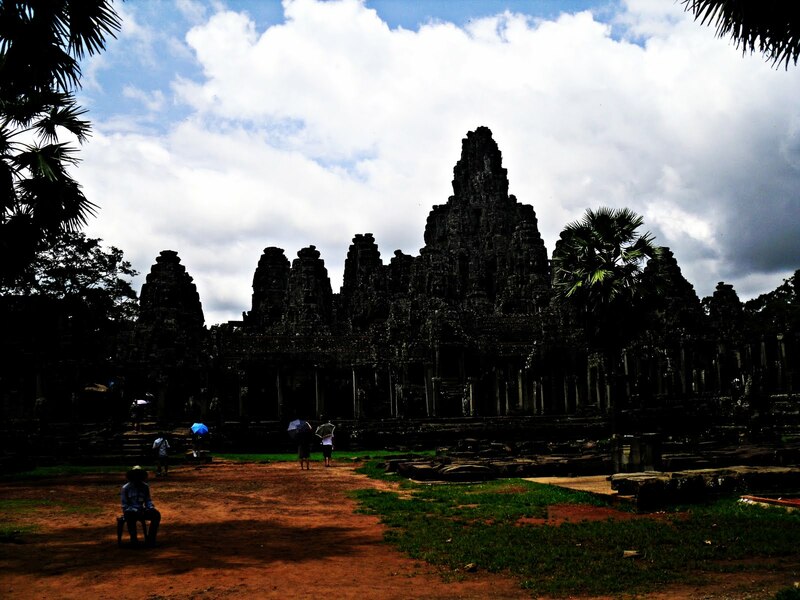 We first stopped at the Angkor Wat, which I thought was the only temple…but it wasn’t. It was however…huge…impressive…and so beautiful. You had to walk across a very long bridge that had been built. 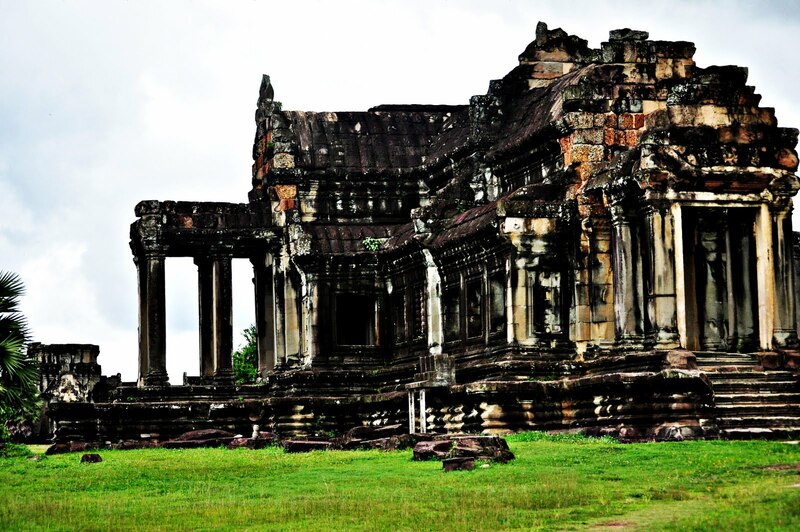 The Hindu temple was built for King Suryavarman II in the 12th century. The temple is somewhat of a HUGE national treasure…it is even on their flag! In the middle of the Vietnam War, Jackie O came to see the Angkor Wat, I guess it was her dream too. The temple is very symmetric and made out of Sandstone. 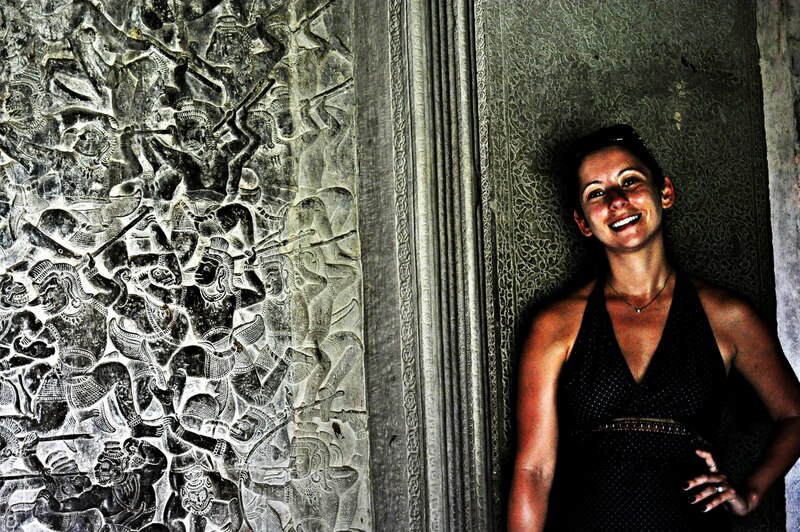 The carvings on the walls and detail in every crevice…unbelievable! Baphoun was under construction, it was completely taken apart for restoration purposes and began to be put back together, but during the civil war, all of the construction stopped. This caused a huge delay on putting it back together. Now, if you look closely parts of the walls are definitely not put back in the same spot because all of the carvings do not match. Even though it had been my dream to see the Angkor Wat, Ta Phrom was incredible! This is the kind of temple that you only see in movies. It was made out of the same sandstone but the neatest part of the temple were the trees that grew all throughout. The trees look like they have been here since the creation of the temple, but grew throughout, in and around the walls and statues. 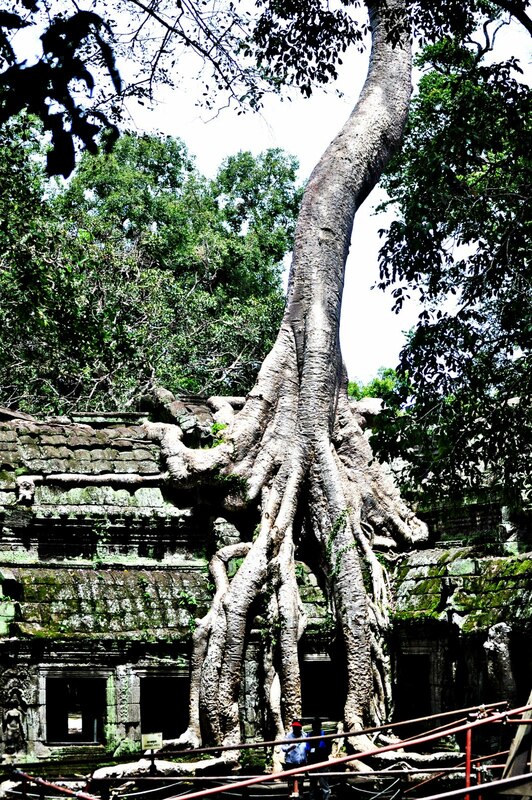 They roots seeped into the cracks of the walls and if the conservation teams remove the trees, the temple will crumble, but if the trees remain, when they die, they shrink and the temple walls crumble anyway…so the poor temple, will one day completely fall. There were many more temples to see, but the day was so hot, and after 7 hours, and almost 700 pictures, we were pooped. Along the way, we met a fantastic family from London. We spent a few hours walking along with the mother, father and two daughters. They were fun, and entertaining. We hope to see them again when we take that part of our trip in a few months! 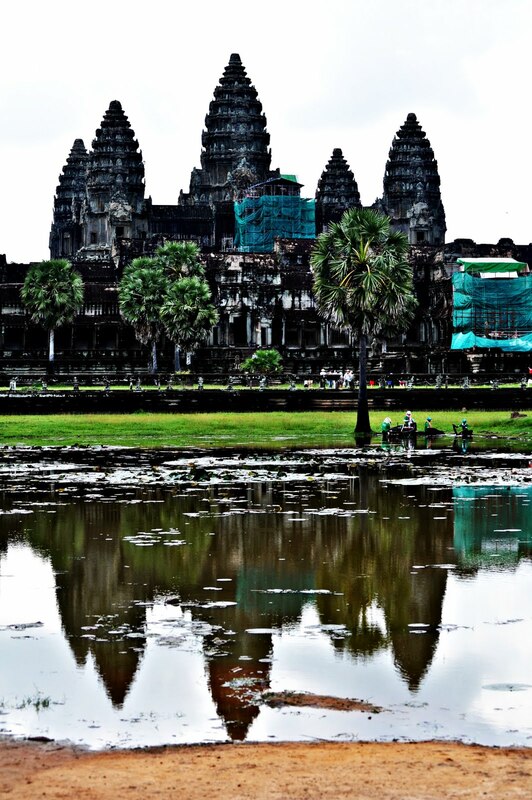 All and all, I can’t believe even today, that I walked through the doors of the Angkor Wat. I will never forget that day, and if any of my students remember me telling them how big it was…it really was that big!